Dresses Used in Middle Eastern Dance Costuming. For both folkloric and Oriental performances. Costumes for SCA & Renaissance Faires. Tips on how to dress for the spirit of the occasion as well as the reality. Fact or Fiction: Which Costuming Lore Should You Believe?. Debunking some urban legends related to belly dance costuming. Palestinian Costumes and Embroidery - A Precious Legacy. Review of a video documentary. From Turban to Toe Ring. Review of a book which includes advice for historical re-enactment dancers. 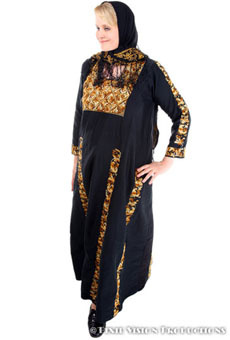 ABOUT THE PHOTO: Shira wears a traditional Palestinian thobe in this photo by Pixie Vision, Glendale, California. What To Wear For Debke. Costume recommendations for dancing the debke, which is a traditional Lebanese line dance. Pants In The Sixteenth Century. Historical look at wearing pants as a garment. Making Your Own Turkish Costume. By Vanessa Giddings. Patterns for gömlek, shalvar, hat, chirka, and entari. Placed online January 14, 2016.